Users are allowed to access URIs that they are permitted to otherwise they get "403 Forbidden. Access Denied" message so the example below satisfies this rule. Also the users, credentials, roles and URIs are all defined in "security.yml". For more info, click here. In example below, we have "Backend" and "Frontend" bundles. Backend is accessible for Admin and Superadmin roles only. Frontend is accessible for all roles but only DefaultController requires no roles so the users with no roles can access it too. Note: This solution is not compatible with "Logout" feature. 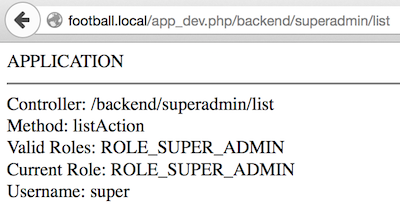 To assign multiple roles to a user, use roles: [ROLE_ADMIN, ROLE_SUPER_ADMIN]. The access control uses the first matching rule to enforce access so start placing the most strict URIs on top.